I am applying for this education award in recognition of my outward-facing work. Recent studies have explored how new types of communication, in the context of supportive relationships, can enhance performance and productivity. Using an outward-facing approach, I have built transparent systems that promote individuals whilst supporting teams to work collaboratively. I support a variety of individuals from school leavers to senior colleagues and lead a number of teams locally, regionally and nationally. My time is split equally undertaking paediatric clinical work and educational activities. Since 2015, I am pleased to report the following; I have had 21 peer review publications (marked #) as last author showcasing 30 colleagues, launched a national undergraduate paediatric curriculum, won the BMA best paediatric textbook prize, was awarded Senior Fellowship of the Higher Education Academy (HEA), won a UCL School of Life and Medical Sciences teaching award and the Presidents Medal from the Academy of Medical Education (AoME). We launched the National Undergraduate Curriculum in Paediatrics and Child Health in November 2015#. I supervised Hannah Jacob (UCLs first educational Academic Clinical Fellow) who undertook this important work and led the project from the outset. We have engaged stakeholders throughout including all 32 UK medical schools, the General Medical Council (GMC), the Medical Schools Council (MSC) and the Royal College of Paediatrics and Child Health (RCPCH) who were all at the launch. We included a wide range of individuals in the Delphi process to publish the final product including parents, medical students and clinical teachers. Several medical schools are already using this open source material to replace existing curricula. I wanted to use the United Nations rights of the child as the basis for a piece of artwork on the children’s ward. My foundation doctor provided five school students (who met the UCL medical school target medicine criteria for widening participation) with work experience to collect data for this project. To have a more meaningful experience, we arranged a programme of learning which included both having a job to complete (asking 100 adolescents for their top 5 UN rights) as well as observing medical role models#. Factors which facilitate access to medicine include having positive role models. I presented this work at a UCL Arena seminar as an example of how art can be central to teaching and provided them with a copy of the final art-piece produced by an adolescent patient for her art A-Level (shown here). I have developed two courses to utilise our community simulation centre (2016-7). who have had difficulty in becoming parents#. (ii) Communication Skills in Child Sexual Abuse is for paediatricians to enhance their confidence in communicating with young people. Both courses use simulation technology with two actors to provide a fully immersive experience. Having written ten books, I was invited as the author-in-residence for Exeter Medical School’s faculty development conference to help plan their book about how clinicians communicate today. By the end they had a clear strategy using a patient journey as the common thread. 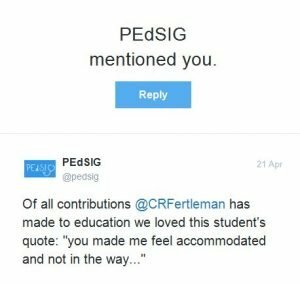 As lead for the Paediatric Education Special Interest Group (PEdSIG), affiliated to RCPCH, I run a group of dedicated paediatric educators which holds twice-yearly, popular meetings. I have led the abstract shortlisting, conference organising and constitutional reviews openly and fairly. PEdSIG has become nationally recognised and we have had competitive applications for our officer positions enabling judicious succession planning. I am on the council for the AoME undertaking an active role in their conferences and workshops, and represent them to their corporate partners as a speaker. Since 2014, I have been a reflective practice tutor on the Medical Education iBSc course at Cardiff University which includes small group work and written assessment. I was able to promote these students (and others from UCL) at the PEdSIG 2015 winter meeting where they presented their projects. I was approached as a known ‘enabler’ to lead a group to embed Lesbian, Bisexual, Gay and Transgender issues within the national paediatric curriculum as these issues had yet to be included. The RCPCH have embraced all our suggestions. We showcased our innovative educational tools by running a workshop at the RCPCH 2016 spring conference and our group is now delivering to a wider audience and has publications in press. I have also led the 2015 curriculum review in both teaching and prescribing competencies for the RCPCH by supporting others. I engage in teaching leadership and management skills by supporting programmes for paediatricians undergoing transition such as the Transition to Leadership#, Transition to Consultant# and Clinic Management#. I regularly back dedicated and enthusiastic colleagues who are applying for awards (both for educational and clinical work). 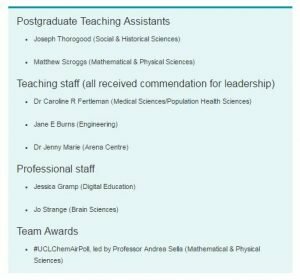 As recognition of my work I am the first primary NHS employee to be supported on the UCL future leaders’ programme. I am involved in both aspects of externality that currently exist for the high stakes assessments for qualifying doctors. Since 2013 I have been an external examiner for Nottingham University and Kings College London. I review all the papers, attend clinical assessments, engage at the examination board meetings and write constructively critical reports. Since 2014, I have been an active member of the MSC who provide questions used by all UK medical schools to set national standards and provide comparative data. I contribute to question writing, provided them with a full set of paediatric normal ranges and have been elected to their Final Clinical Review Group. This month I have supported six foundation doctors to write 32 Single Best Answer questions. I am both an examiner for all the clinical years for UCL medical school and local site lead. I am an MRCPCH clinical examiner and senior assessor and question writer for the paediatric exit assessment. I introduced UCL medical students for the candidate to teach thus actualising the top of Miller’s pyramid; “does” in the teaching station#. Whilst hosting the paediatric membership (MRCPCH) exams, we videoed patients and created a useful training resource for both undergraduates and postgraduates. Both are open-source and the later has been set up like a clinical exam circuit with over three million hits#. Safeguarding is a significant and important area of my workload. Having secured grants of £34,000, I led the team to provide training for faculty and course delivery for the Child Protection Recognition and Response course#. I have written ‘The Practical Child Protection Handbook; Best Practice for Health Professionals’ published by Oxford University Press (2016). I am the medical lead for UCLs Virtual Reality (VR) Centre (https://vep.cs.ucl.ac.uk/). The basis of our current research is using child avatars in safeguarding training. In February 2017, I led a facilitated discussion about the use of VR in antibiotic stewardship at UCLs 3rd digital healthcare conference with a forum of medical doctors, ethicists, pharmacists and VR specialists. I became an academic member of the UCL research ethics committee September 2016. I was complimented recently at the thoroughness of my contributions when assessing the significant number of applications for our monthly meetings. I have supported ten teaching fellows in the last five years and large numbers of trainees in my role as Training Programme Director. Additionally, I have provided ongoing support to those with disability introducing them personally to the GMC. Students are often grateful for my support, for example recent feedback: ‘I have had mobility problems for three years and you are one of a very small number to go out of your way to make adjustments for me. That you made me feel accommodated and not in the way, means a lot to me’. This January I organised the inaugural ‘Women of the Whit’ conference to support and inspire women in medicine. 80 attended including 40 UCL medical students many of whom fed back that this was the most enjoyable day they had yet spent at UCL. We had keynote speakers, workshops run by trios of consultants, junior doctors and medical students and a career speed dating at lunchtime where advice could be sought and offered. Additionally, there was a Medical Women’s Foundation stand, a bespoke logo (shown here) and a pop-up shop. Compassion has become increasingly important to me. My dog is trained to go onto the wards to improve staff and patient well-being. He met all the incoming clinical medical students at their induction to contextualise this point. I established a staff knitting group making twiddle-muffs for patients with dementia. UCL occupational therapists have clamoured to get them for their research. Finally, I have arranged concerts on my ward for patients and staff and regularly run sessions on mindfulness.